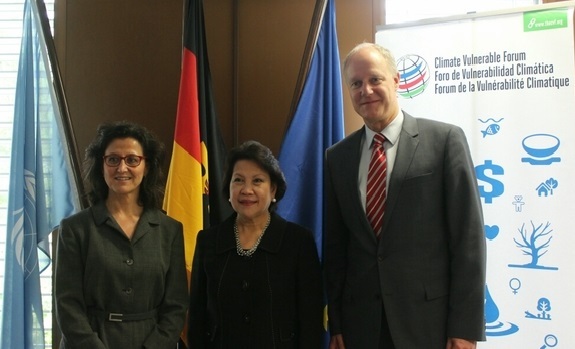 Geneva – 14 June, 2016: Germany signed a 100,000 Euro Federal Foreign Office grant in support of 2016 activities of governments collaborating in the Climate Vulnerable Forum (CVF) and the Vulnerable Twenty (V20) Group of Ministers of Finance, whose Secretariat is hosted by UNDP. The grant agreement will support UNDP to enhance the capacity of representatives of climate vulnerable countries to contribute to move effective policy-making at international and national levels. It will specifically support strategic global policy events of the Climate Vulnerable Forum and V20 focused on priority issues of these to related cooperative bodies that represent one billion climate vulnerable people in Africa, Asia, the Caribbean, Latin America and the Pacific. UNDP is the largest service provider in the UN System on climate change and manages a $2.3 billion portfolio of mitigation and adaptation projects across nearly 170 countries globally. UNDP’s work focuses on supporting country partners to make progress on SDG7 and SDG13, on sustainable energy and climate change respectively, as well as working with countries to develop and implement their targets and actions towards the Paris Agreement. UNDP’s ultimate goal, a zero-carbon, resilient path to sustainable development.